The NBA season is now one week long. While there’s not a whole lot we can take from the early-season slate, some teams and players have proven themselves to be major winners. Meanwhile, the Los Angeles Lakers are among the entities that have to be considered losers from the past week. Multuple suspensions and a three-game losing streak to start the season tells us this story. In what will be a weekly feature, we check in on the winners and losers from around the Association over the past seven days. It might sound ridiculous, but this two-time MVP is playing the best basketball of his career over the first week of the 2018-19 season. He’s averaging 30.5 points, 5.0 rebounds and 7.8 assists per game while shooting at a 53 percent mark from the field as well as a 47 percent mark from distance. Curry’s 22 made three-pointers also represent an NBA record for the first three games of the season. Outside of the basic stats, we’re seeing the 30-year-old Curry show some youthful exuberance. He’s not displaying any signs of slowing down. Quite the contrary. The three-time NBA champ is 100 percent healthy and ready to dominate. That has to be a scary proposition for opposing NBA teams. Missing former NBA MVP Russell Westbrook for the first two games — both losses — didn’t help matters here. Even then, the Thunder ended their first week of the regular season with a 0-3 record. Losing to Golden State on the road, sans Westbrook, isn’t a big deal. Falling to the hapless Los Angeles Clippers and Sacramento Kings by a combined 27 points is certainly a big deal. Paul George’s struggles have continued from last season’s playoffs. He’s shooting under 40 percent from the field and averaging four turnovers per game. Meanwhile, the Thunder are giving up a ridiculous 115.7 points per game. That’s not going to cut it in a top-heavy Western Conference moving forward. Period. Just recently handed a rookie-level max extension prior to the start of the season, Booker looks to be 100 percent and ready to go after suffering an injury during the summer. The soon-to-be 22-year-old guard is averaging 29.5 points and 6.7 assists for a Suns team that has been surprisingly competitive this season. He’s also shooting at a remarkable 40 percent from distance. If Booker continues to play at this level, he’ll be a first-time All-Star. More important for the team in the desert, his star-level ability will help the likes of fellow youngsters DeAndre Ayton and Josh Jackson improve moving forward. A season that started with rebuild on the mind could tun into the Suns being fun to watch. Booker leads the charge in that regard. Despite having earned five All-Star appearances in his 10-year career, Love has proven that he can’t be the go-to guy for a contending team. This was the case earlier in his career with the Timberwolves, and that has not changed with LeBron James now suiting up in Hollywood. It will also likely lead to Love being dealt prior to February’s trade deadline. With his Cavaliers at 0-3 on the season, Love has struggled to do anything of substance. He’s shooting at a 30 percent mark from the field and boasts an absurdly low .263 three-point percentage. This has led the lowly Cavaliers to losing their three games by an average of 13 points per outing. Simply put, the team is just not competitive. Love is one of the primary reasons for that. It was somewhat of a surprise to see Leonard already sitting out a game for rest during the first week of the season. Maybe it’s Toronto’s way of making sure he’s fresh throughout the season. And through four games, that has absolutely been the case. These Raptors are a perfect 4-0 with wins over both the Boston Celtics and Washington Wizards, two playoff teams from a season ago. For his part, Leonard has just been brilliant in his three appearances. Now seen as a clear MVP candidate, he’s averaging 25.7 points and 8.7 rebounds per game. Toronto is also a combined plus-57 when he’s on the court. That’s some elite-level stuff there, and it has Toronto thinking conference championship early in the season. We hate to put a rookie who suffered an unfortunate injury in this article. But even prior to going down with a sprained ankle in his third regular season game, Knox was struggling big time. Having lost out on a starting job during the preseason, Cox is shooting just 35 percent from the field and averaging less than 19 minutes per game. The issue here is that New York selected Knox not only for how he might project moving forward but his ability to contribute immediately. In a season that’s going to be defined by a tremendous rookie class, Knox’s struggles will be magnified even further. Having to sit the next two-to-four weeks won’t help matters in that regard. On the other end of the ledger, Doncic has been sensational in his first week as an NBA player. No one really thought the Slovenian would struggle out of the gate. After all, he dominated pro basketball across the pond over the past couple seasons. But his transition to the best league the world has to offer has been amazing. Still just a teenager, Doncic is averaging 18.3 points, 5.7 rebounds and 4.3 assists per game. He also has the Mavericks at a surprising 2-1 on the season with consecutive wins over the Bulls and Timberwolves. It’s going to be a blast to see this young kid grow as the season progresses. We can focus on Carmelo Anthony’s struggles and inability to effectively take on a bench role early in his first season with the Rockets. But who didn’t expect this to happen? Melo has always been a me-first player and seemingly thinks more of himself than reality itself might suggest. Instead, the focus here has to be on both the Chris Paul drama and Houston’s early-season struggles on the court. Paul didn’t do himself any favors by getting into it with Rajon Rondo and the Lakers this past Friday night. It led to a suspension for the nine-time All-Star. And from an on-court perspective, Houston’s 1-2 record leaves a lot to be desired. That includes a road loss to Paul’s former Los Angeles Clippers squad. Ouch. There are three players we can include in the early-season MVP watch list. That includes Stephen Curry and Kawhi Leonard, both of whom we covered before. But the Greek Freak has to top this list. He’s been absolutely amazing during Milwaukee’s 3-0 start to the season. How good? Antetokounmpo is averaging 27.3 points, an NBA-high 16.0 rebounds and 5.7 assists per game. That included a 26-point performance in a blowout win over the Indiana Pacers. All said, the Bucks are a whopping plus-34 when this dude is on the court. Having morphed into one of the game’s best players, Antetokounmpo still hasn’t hit his prime. That’s just scary. 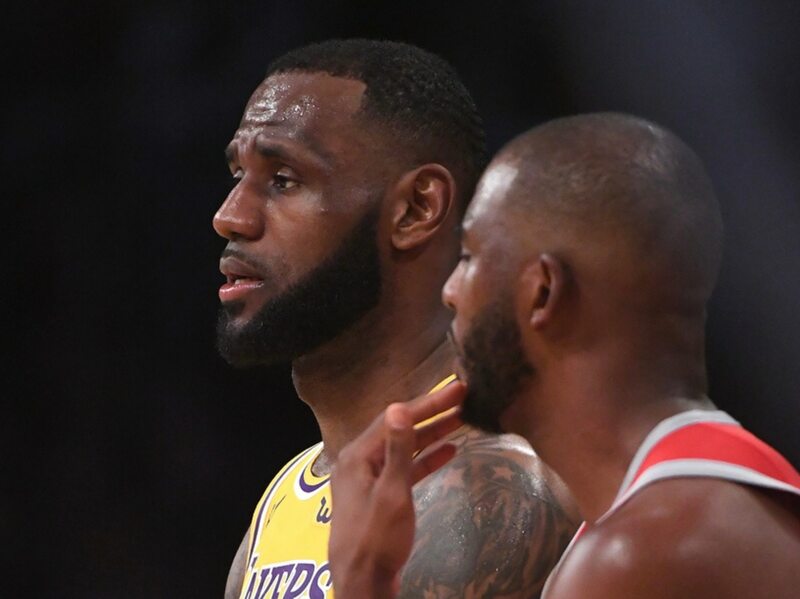 Aside from their 0-3 start and a heartbreaking loss to the Spurs this past Monday night, drama has been the name of the game in LeBron James’ first season with the Lakers. Both Brandon Ingram and Rajon Rondo were suspended for their involvement in a fight with Houston Friday. And in reality, this is what we had to expect. After signing James, the Lakers decided to surround him with a bunch of castoffs and hot-heads. Obviously, it’s bitten them in the back end. On the court, it’s not much better. Los Angeles is giving up 131.7 points per game. Meanwhile, James himself is shooting just 16 percent from three-point range and is on pace to put up his lowest field goal percentage since the King’s rookie season. Sure it’s going to take time for all of these parts to coexist. But as of now, it’s simply been ugly.